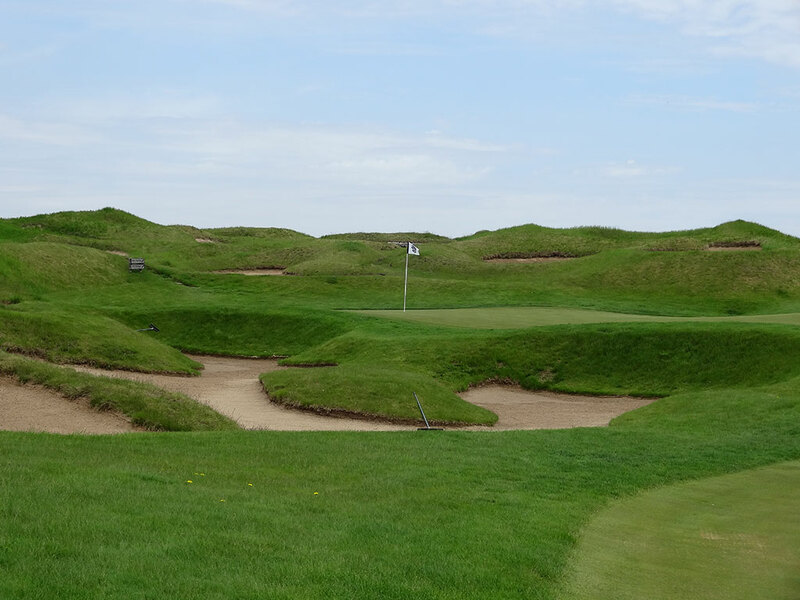 Course Website: Official Website - Visit Whistling Straits (Irish)'s official website by clicking on the link provided. Accolades: Ranked 7th in Wisconsin on Golf Course Gurus' Best in State list. 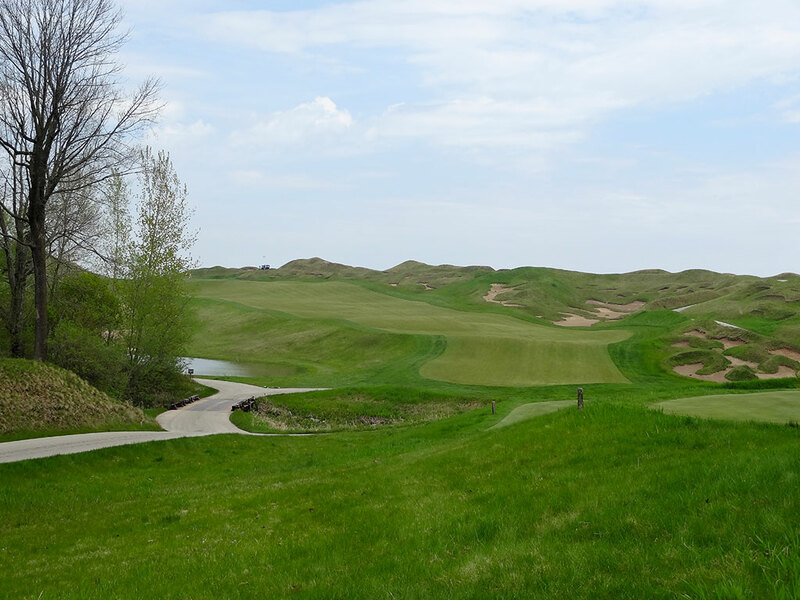 What to Expect: While the Irish course will always play second fiddle to the Straits, Pete Dye's inland offering should absolutely not be missed when visiting the Wisconsin resort. 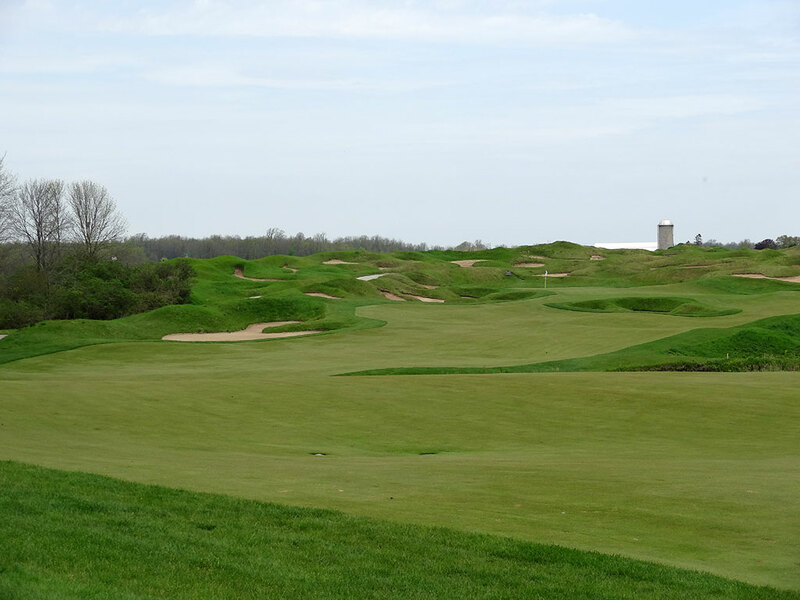 The Irish course delivers a layout that is more protected from the winds that roar off Lake Michigan and about half as many bunkers. 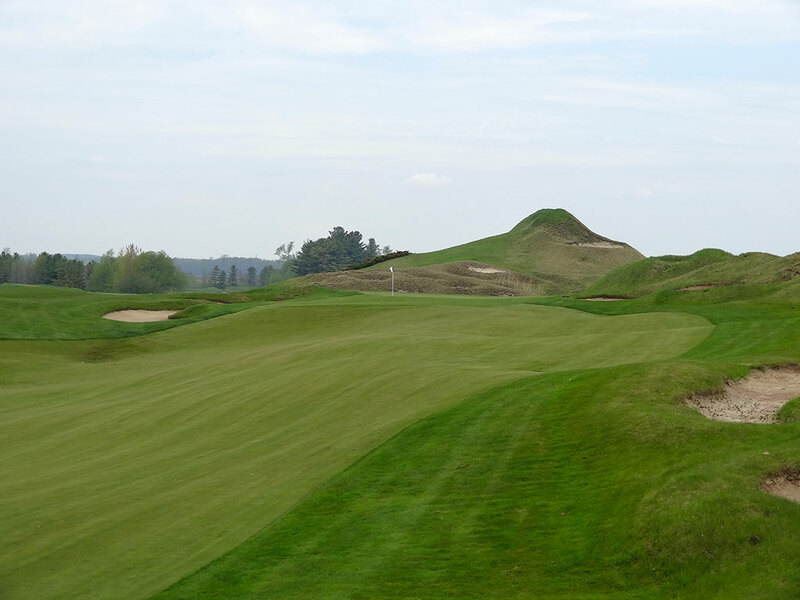 Unlike the Straits, the Irish course features bentgrass fairways and greens which provide a softer playing surface than the fescue next door as well as superior conditions early in the season. Fairways aren't as wide as the Straits course and water comes into play on a handful of the holes. The back nine is the more difficult of the two sides with some punishing holes down the stretch that will test even the best of golfers. 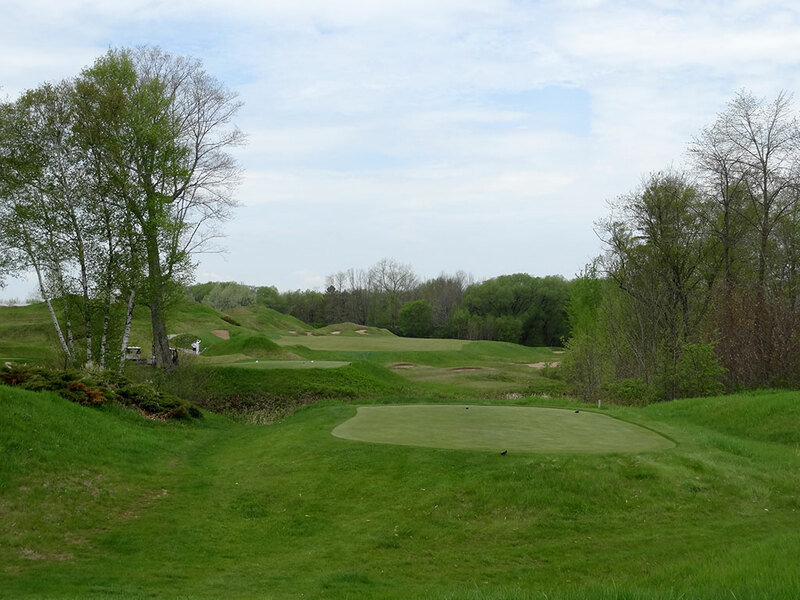 The inward nine also features more elevation changes to contend with which provide some exciting shots as well as a couple potential blind ones; most notably the par three 13th. Lastly, if walking isn't your thing, carts are allowed on the Irish course to navigate the terrain. 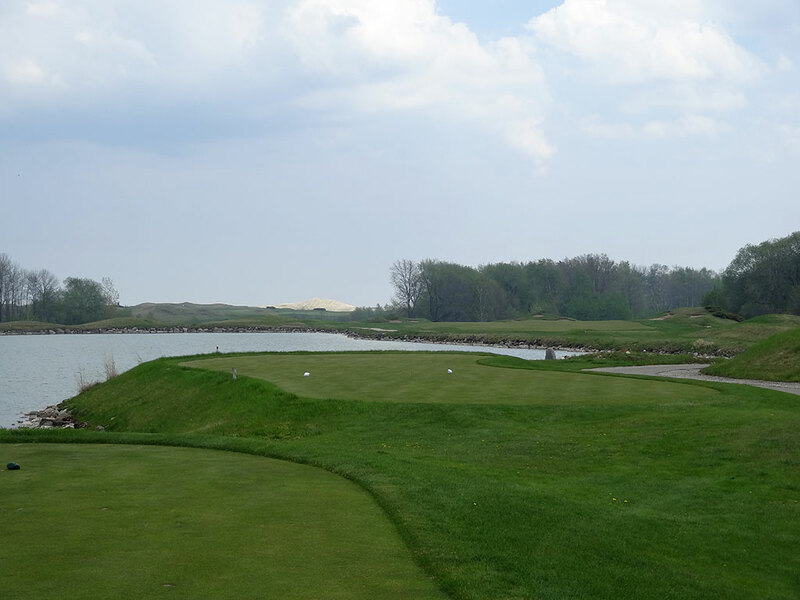 Signature Hole: 18th Hole – 558 Yard Par 5 – The Irish course's dramatic finishing hole is highly memorable and one of the most impressive holes at Herb Kohler's world class facility. The green is out of sight from the tee as players are presented with a sharp dogleg right protected on the inside corner by a bunker. The drama kicks in as players are presented with an impressive climb up to the bunkerless green site that requires a carry over a creek. Tee shots up the right side will be blocked from seeing where to layup due to the mounding up that side and missing the green on your approach will result in a stiff kick down a slope. Best Par 3: 13th Hole – 183 Yards – Love him or hate him, Pete Dye isn't afraid of designing bold and unique features into his golf courses and this hole is another example of that pattern. Despite the extra tall flag here, pin locations on the right side of the green can be blind from the tee depending on which box you are playing from. The putting surface is absolutely huge and is surrounded by a plethora of bunkers that looks like it could take a small army to maintain. The green sits in a bowl well below the general terrain and the tee box offers extensive views across the surrounding property. Three putts will be common here giving the size and movement found in the green and the overall unique factor of the hole is extraordinary; for better or worse. 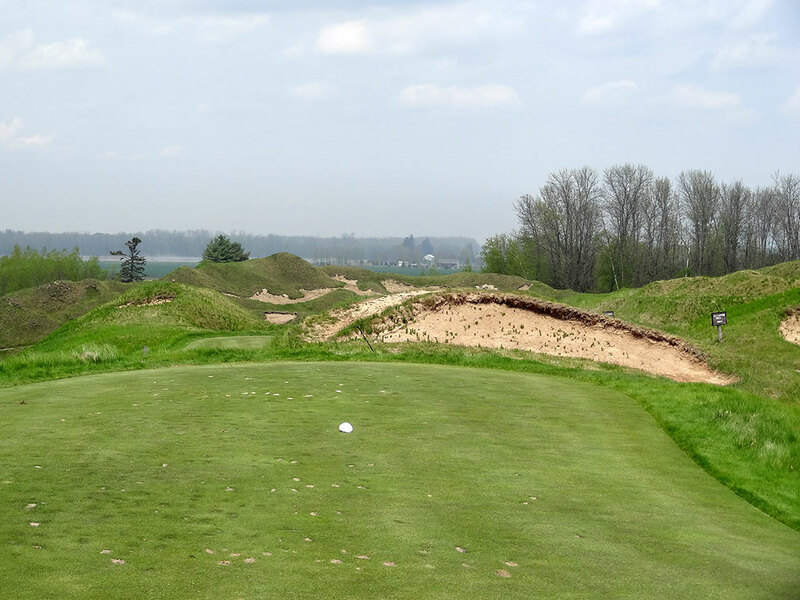 Best Par 4: 10th Hole – 398 Yards – Dunes, dunes, and more dunes. 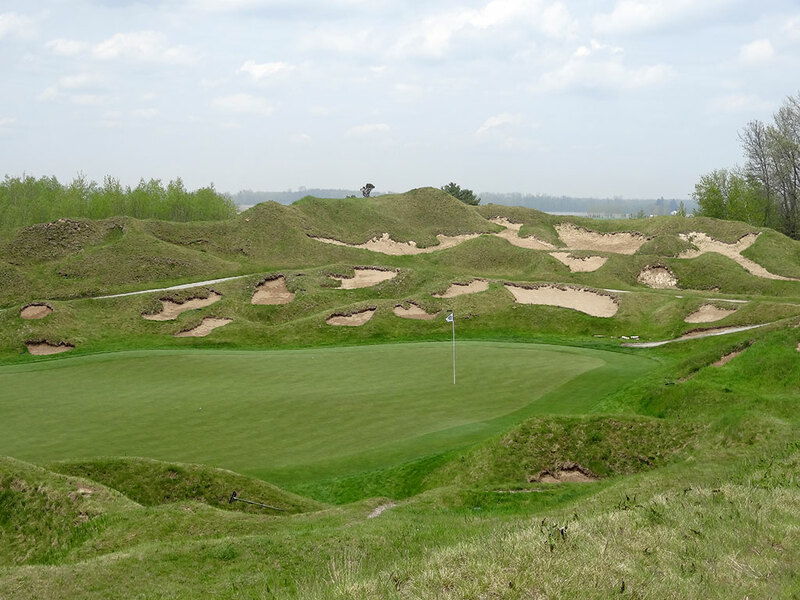 Dye frames this hole with large dunes and deep bunkering on both sides with the right side being particularly penial. Tee shots that leak right of the fairway will be faced with a blind approach to the green while tee shots in the fairway will have a clear view of the uphill approach awaiting them. Bunkers protect the early part of the green but players taking enough club to climb the hill will have a single pot bunker long and right to worry about. The visuals from the tee are impressive and the approach shot is more challenging than it appears off the tee which combines to create a great hole to play. Best Par 5: 8th Hole – 555 Yards – From the tee box players have no idea just what is in store as a fairly tame tee shot is presented with an aiming bunker in the distance. Once players reach the corner of the dogleg they are presented with an impressive visual of a river cutting through the fairway and a bunker sitting right in the middle of the layup zone short of the green. A distracting number of bunkers sit behind the green as one more item for your eyes to digest before pulling the trigger on a layup shot or a rip at the green. The safe play is laying up to the 100 - 150 yard range which will clear the water and keep you short of the bunkers while players going for the green will have more luck with a right-to-left shot shape due to the opening offered to the putting surface. 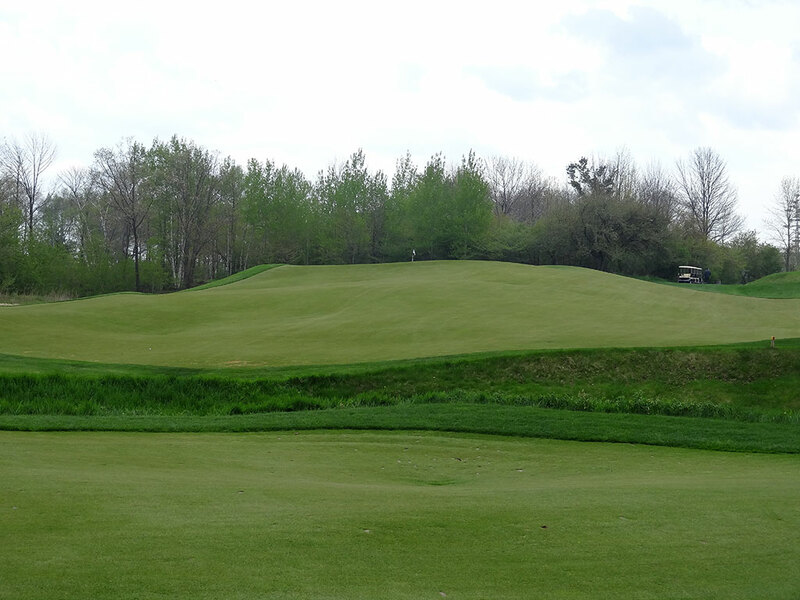 Birdie Time: 3rd Hole – 147 Yard Par 3 – Pete Dye doesn't yield a lot of birdie opportunities in his designs except for the short par four he likes to fuse in. At the Irish course though it is this short par three that presents a perfect chance to go pinseeking and throw a birdie on the card. Water flanks the left side of the green and creates but the biggest concern on the hole, but the green is large enough to feel confident going at the majority of pin placements available. 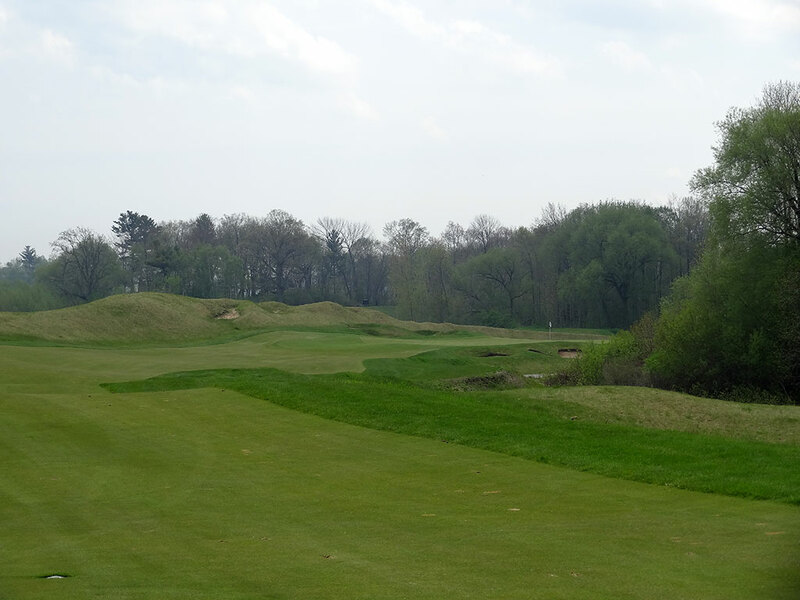 Enjoy the relatively easy start here at the Irish course because it doesn't last long. 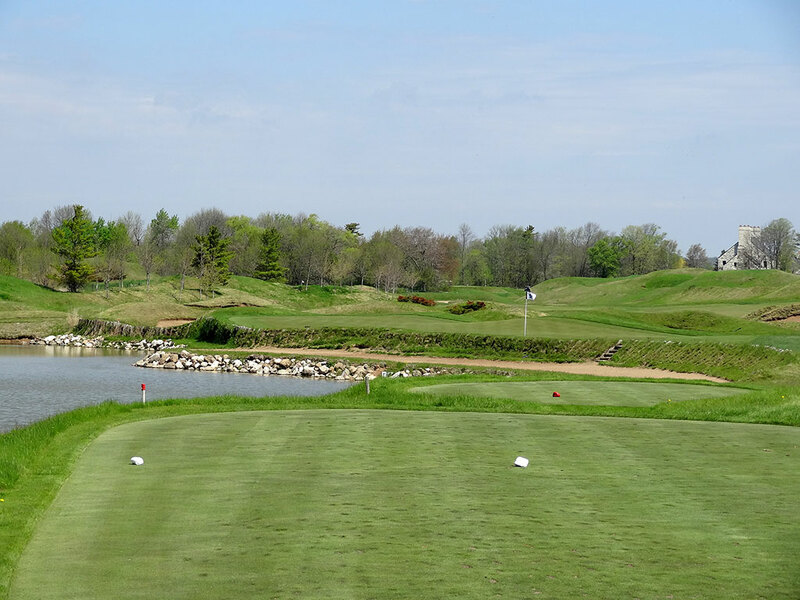 Bogey Beware: 15th Hole – 479 Yard Par 4 – Two of the par fives at my home course play less than 500 yards so when I see a par four of this length I know that bogey can quickly be a factor; especially if the wind is coming in off the lake on this hole. A tee shot right of the fairway is virtual death if par is your goal as a creek and trees come into play and can derail your score in a heartbeat. Playing up the left side of the fairway provides the most safety but still leaves a lengthy approach shot and brings the only fairway bunker in the play. Approach shots that come in from the left enjoy an unobstructed path into the green while the right side features a half dozen bunkers ready to gobble up your ball and chuckle in your sorrow. The old cliche is, “Par is a good score here.” Well, bogey is a pretty good score too.